2. Grate the cauliflower and place in the steamer for about 4-5 minutes to soften. Leave to cool slightly. 3. Beat the eggs and finely chop the mozzarella. In a blender, mix the mozzarella, cauliflower, eggs and seasonings at medium speed until a dough-like paste forms. 4. Top a baking sheet with parchment paper and add a little olive oil to prevent sticking. Add the pizza dough to the tray and spread out to make a circle. The base should be around 1cm thick. 5. Place in the oven and bake for 20-25 minutes until cooked through and golden around the edges. Remove from the oven and flip over gently. Bake the underside for a further 10 minutes. 6. While the base is cooking, start to make the sauce and prepare the toppings. 7. Heat some olive oil in a pan and stir in the tomatoes, garlic, basil, salt and pepper. Cook over low heat, stirring occasionally. 8. 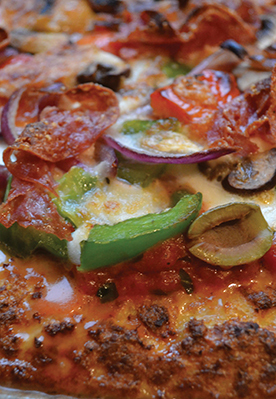 While the sauce is heating through, make sure all your toppings are chopped and ready to be placed on the pizza. Once the sauce is cooked through, spin through the blender just long enough to beat out the tomato skins. 9. When your base is looking nice and golden, it’s time to top your pizza. Remove the base from the oven and add the tomato sauce and your toppings. 10. Place the pizza back in the oven and bake for 10-15 minutes until the cheese is melted.